The 20th century was a tragic period in the history of the Cossack people, during which they found themselves on both sides, cast in the role of both victims and aggressors. Split by wars and revolutions, the Cossacks performed many heroic deeds but were also responsible for many atrocities. RBTH traces the Cossacks' history since 1914, in Russia and abroad. Cossack divisions, whose supreme commanders were calledatamans, were one of the main pillars of Russia’s ruling regime. They were frequently used to disperse rallies and to suppress peasants and workers during the 1905 revolution. Yet some of the Cossacks refused to go against the people and protect landowners. Frustrated by their never-ending hardship, in some villages Cossacks even dared to rise against the authorities. But the outbreak of World War I changed everything. The name of CossackKuzma Kryuchkovwas to become known across the whole of Europe during the war. Kryuchkov, together with three fellow soldiers, killed a German cavalry platoon of 27 men, and became the first soldier in World War I to be awarded the Cross of St George, for "undaunted courage". Overall, more than 120,000 Cossacks received different distinctions of St. George in the course of the war. In the meantime, villages left without a male workforce were slipping deeper into poverty.The authorities had completely lost the support of the Cossacks by the time the February 1917 revolution took place. A number of Cossack units that were sent to disperse the protesters not only refused to obey the command but joined in the uprising. In October 1917, the Bolsheviks overthrew the provisional government of Alexander Kerensky, and many Cossack units in St Petersburg went over to their side. The revolution divided the Cossack people. 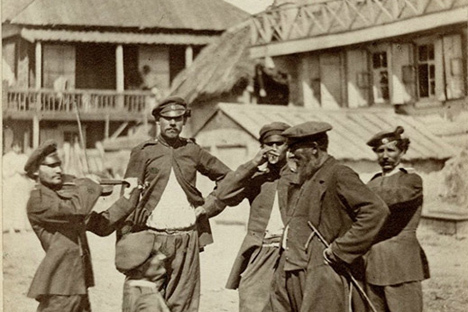 Many poor Cossacks welcomed the first decrees of the new authorities: The Bolsheviks announced that Russia was quitting the war, promising land to the Cossacks andnot to interfere in their affairs so long as they did not oppose Soviet rule. And yet it was in the very heart of Cossack Russia that the main hotbed of resistance to the new Soviet authorities was to emerge, on the banks of the river Don. In the late 1930s, the USSR began to prepare for the war that it anticipated was to come. Restrictions on Cossacks' rights to serve in the Red Army were lifted, and they were allowed to wear Cossack uniform. When World War II started, many impoverished Cossacks rode into battle on scrawny collective farm horses armed with just swords and knives. However, that in no way diminished their courage: They would jump from the saddle onto tank armor, cover observation slits with their coats and set tanks on fire with petrol bombs. Some cavalry divisions were renamed Cossack divisions before World War II, even though Cossacks formed just a small part of them: The enemy was terrified of the very word "Cossack". The leaders of the Cossack divisions which had fought on Germany's side – Krasnov, Lieutenant General Andrei Shkuro, German general Helmuth von Pannwitz and others – were hanged in Moscow in 1947. The other prisoners, including women, were sent to Soviet labor camps. In 1955, those of them who survived were amnestied. They continued to live and work in the USSR, keeping their past a secret.